Black 47 are Celtic rock legends in NYC. They formed in the Bronx back in 1989 and have played about 150 shows each year since. Always remaining true to their principles and their political views has cost them real fame. Due to their independent stance on affairs in the North of Ireland, their UK record companies refused to give them any support, thus cutting off the lucrative European market. They were also one of the first bands to make a stand against the Iraqi war. They always return to New York City to play on St. Patrick’s Day. For their 21st consecutive NYC show on the holiday, they will be at B.B Kings tonight starting at 7pm. They also just released a new album on March 2nd titled Bankers and Gangsters. 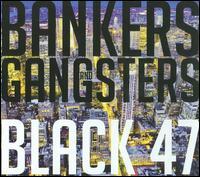 It is vintage Black 47 and if you like what you hear here, you should give it a listen. Enjoy the day and feel free to share some good stories about your evening. View Our Easy To Use Map Of Ireland Go Where Ireland Takes You Today! The Indie Band Guru is here to help introduce you to new music as well as provide tips to help advance your music career. any amount you could give to keep us up and running would be greatly appreciated.